Even, with an all volunteer staff, substantially decreased vet services and medicines purchased at cost, our organization continues to go in debt. Donated funds have averaged $ 1200.00 - $1400.00 a month with a need to operate on $5,000 -$ 8,000. If 80 people would support us with $100.00 a month we will be able to continue to say, "Yes, We "C.A.N." Make A Difference!" We are a pro-quality life organization that is successful because the community takes action. We need your help now. Click on one of the programs below to make a donation. Become a CAN Member and get a "Pet's Driver's License"! Donate For A Non-Event Fundraiser! Donate to "Feed the Kitties!" Donate to "Save a Life!" Care for animals in your home: Join our network of available foster homes! Help Animal Network at their adoption events!For both children and adults! More opportunities at "Animal Network"
If you have to move, move to pet friendly neighborhood/apartment. If it's not possible, put your pet up for adoption through us or another program AS SOON AS you think you'll be moving. DO NOT wait until the week of your move, no one will be able to help you. If you ever have to give up your pet for any reason, don't turn it over to a shelter, show your pet you care by giving it time to go through an adoption program like ours. For a $100 donation you can become a member of our community. To thank you for your donation we will send you a Pet's Driver's License of your choice! CLICK HERE for more details. HELP US FEED THE KITTIES! Every month we are saving newborn kittens from death when people turn over their cats to our free "spay and return" program, rescue them from shelters, and rescue them when their mother dies. NOW WE NEED MONEY FOR KITTEN FORMULA! 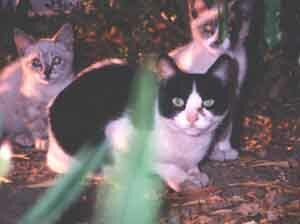 $25.00 Will feed four (4) abandoned kittens for one week! We need $456.00 to order 24 (28 0z) cans of powdered milk at a discount. Rescuing, bottle feeders, and pregnant moms are very expensive. a vetrinary bill for one or more of our foster pets. This kitten is one we only just recently sent to the vet. She had a broken leg (femur had broken) and the bill to fix it was $389.00! Help us by making a donation of any size to our program. To help cut down on the number of wild cats on the street we offer free spays to many people with stray cats every year. Soon we will me making a program to help you help us pay to keep it up! Just want to help out and don't care what exact process it goes towards? Thank You! Join Our Network of Foster Homes! 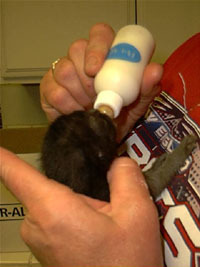 Help us by taking in a litter of kittens to raise until they are old enough to be adopted. We provide the money to pay all their bills, and you provide the love and care. To help them find new homes, you will make a personal profile of each kitten, and bring them to our weekend adoption events until they find new homes. Every weekend Animal Network holds their adoption event at Fashion Island Newport Beach in front of the Russo's Pet Store. They constantly need help setting up, assisting customers, and keeping the animals comfortable.